I can't believe it's been a year already! I felt like such a spaz writing my reviews at first, cause I didn't know what to say and now I almost can't stop talking. I'll try not to make this too long and make you guys snooze! Jamie, being the wonderful leader of our little group, gave us a nice set of questions to choose from, so without further ado, a little more about me. So, hi, I'm Daisy, a 23-year-old medical intern. Oh, and I love books, did I mention that already? I contribute to the Broke and the Bookish and also have my own little blog called Between the Pages, which is where I can usually be found. I mean that both literally and figuratively speaking. I so wanted to show you guys my awesome bookcases, but sadly, my camera decided die on me. 1. How Do You Balance Reading and School/Work? To be honest, I don't really. There's not much balance to go around, I either study really hard and sadly have no time for reading. Or I read and conveniently *forget* I should be studying instead. It's gotten somewhat easier now I have an ereader and can just pile books on there in case I go anywhere on weekends or for the commute to and from the hospital. Seriously, it fits in pretty much any purse I own, so I can take a book with me anywhere, I love it! I work about 50-60 hours a week and with my boyfriend sometimes needing cuddles and friends and parents who want my attention sometime, it can get tough to squeeze in reading time. I always try to read before going to sleep and Saturday is my designated reading day, you have to be really persuasive to convince me to do otherwise. 2. Do you have any authors whose books you'd put on an "auto-read" list...no matter what they wrote? So this one is easy: J.K. Rowling. There's no questioning it, if she ever decides to write another book/series/essay/ANYTHING, I'd buy it. 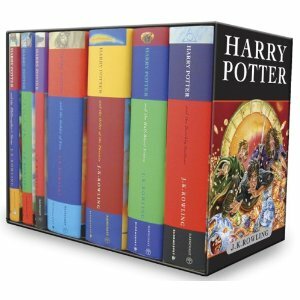 I so loved Harry Potter, I can honestly say my life would be less -for lack of a better word- magical if I hadn't read them. The same goes for Patrick Rothfuss and Suzanne Collins, their books go on auto-buy. And if Jane Austen were still alive and kicking, she'd be on the list too, cause I so love her books. And this is the mind that created Mr. Darcy, who knows what she would have come up with if she'd lived longer. This describes my love of reading so absolutely perfectly, everyone should feel like this at some point in their lives I think. I can't imagine a life without books and this exact feeling. 5. Do any of your friends, family or significant other share your passion? Well, I have friends who read. My mother reads. I've even convinced my boyfriend to pick up a book this year. But none of them share my passion. I mean, seriously, it's one of the best things about blogging: you guys say 'nice haul' when I'm telling about 15+ books I've gotten from a sale, while my friends and family ask me if I really need them. I do. I need all of them. Also, my friends probably read 15 books a year or something. I sometimes read that much in 2-3 weeks. 1. I'm studying medicine, but I hate going to the doctor myself and I always self-diagnose before I got. Which is probably really annoying (sorry!). 2. I speak Dutch, English, French, German and a little Latin. I really wish I could speak Chinese or Spanish, that would be awesome! 3. I make a mean chocolate pie. It's so good even one of my friends who doesn't like chocolate pie (which is weird on a whole unique level altogether), loves it. 4. My to-read list on Goodreads has 824 books on it, 95 of which I physically own. 6 months ago, there were 591 on this list. I've read 79 books since and am beginning to fear I will never see the end of the list. It's exploding and it seems to grow overnight by itself. 5. I love watching Ugly Betty (so sad it ended), Grey's Anatomy, America's Next Top Model and Gossip Girl. I love relaxing with all the drama going on there. You all still awake? Thanks for taking the time to get to know me a bit more and if I did make you snooze, at least you got a nice little nap out of it right? I looove your pictures! So cute you are! Who the heck doesn't like chocolate pie??! And I'll gladly have you send me one :) haha. And I'm jealous that you know so many languages. I'm hoping to learn Italian this year..that's my goal. I also love book sales where the books cost hardly anything. I bet you're one of the worst patients when you have to go to the doctor's. It's so fun getting to know all you guys! Glad to see someone else out there watch ANTM. I feel so silly admitting I watch it. LOVE the quote from Never Ending Story! It's always been one of my favorites. I'd say J.K. Rowling is an auto-read for me too. I own Tales of the Beetle Bard. When I heard she was writing that I had to get it as soon as possible. How fun, Daisy! I love that book quote you posted. I've never read Neverending Story, but I think I should! I'm so envious that you speak so many different languages! My dad and his parents are Dutch immigrants (they came over by ship), and I get frustrated when I can't understand what they say to each other! I LOVE CHOCOLATE PIE. I might need a recipe! My to-read list on Goodreads is just like yours. I can't read fast enough! Just saw your guest post over at Ben's blog. Book Bloggers are a writer's best friends. Even if you give us a terrible review, if you spell our names right, we're in your debt. Chocolate pie is what the gods eat on Mt. Olympus. I'm sure of it. I also loved The Neverending Story and cried unabashedly - while waiting at my mother's doctor's appointment so this was in the middle of a crowded room - as I read the end. Awesome quote from The Neverending Story and I can definitely relate to the out of control To Read list! It was so nice to *meet* you! I love all your answers and the pictures. I have sadly not read a single Harry Potter book. I should be shunned. Great post! I LOVE the quote you shared! It's so true! I will be sharing that with Book Club. You read a lot of books for someone who works that much! I am impressed! I love the quote you posted. I didn't know that was a book though, I've only seen the movie (it was so long ago I barely even remember it). Gosh, I wish I had your language skills!